The battle between Samsung and LG over OLED technology patents has been winding down recently, and it looks like there may be an end in sight. A new report says that Samsung and LG are planning to discuss the OLED dispute as soon as next month, and there has already been chatter of cross-licensing deals on the table. The dispute has been going on for a while in Korean courtrooms. It started in 2011, when Samsung suspected researchers of leaking information to LG. 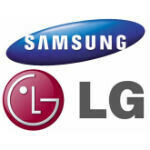 In 2012, LG served Samsung with a patent suit, and Samsung moved to have LG patents annulled. But, a bit over a week ago, both sides agreed to drop their respective suits and talk about a resolution. Now, it seems those talks will happen next month. Even better, both LG Display chief executive Han Sang-beom and Samsung Display chief executive Kim Ki-nam have expressed willingness to resolve the dispute. Kim even went so far as to say that Samsung is "considering cross licensing patents". So, the end is in sight. I'm glad Samsung and LG are handling this the right way, unlike some companies. I would really like to know who was in the right tho. All I know is for HDTV's LG and Samsung make some beauties. I regret not getting an LG 3D TV....I got a Toshiba. Samsung's cost too much for what I wanted.